Habit: Perennial herb 15--60 cm; rhizome creeping, slender, tuber-bearing. Stem: slender. Leaf: sheath appendages 0.5--1 mm, rounded, firm; blade cylindric, upper exceeding inflorescence, crosswalls complete, prominent. Inflorescence: lowest bract >= inflorescence; clusters 2--20, 10--25-flowered, spreading, spheric. 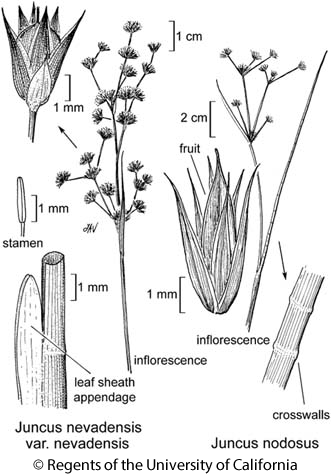 Flower: perianth parts 2.5--4.1 mm, acuminate, +- equal; stamens 6, filaments > anthers. Fruit: > perianth, slender, sharply 3-angled, long-tapered. Seed: 0.5 mm; appendages small. Chromosomes: 2n=40. Citation for this treatment: Peter F. Zika 2015, Juncus nodosus, in Jepson Flora Project (eds.) Jepson eFlora, Revision 3, http://ucjeps.berkeley.edu/eflora/eflora_display.php?tid=29695, accessed on April 19, 2019.
se SNH, SnGb, W&I, n DMtns; Markers link to CCH specimen records. Yellow markers indicate records that may provide evidence for eFlora range revision or may have georeferencing or identification issues. Purple markers indicate specimens collected from a garden, greenhouse, or other non-wild location.